Pumpkin is such a versatile vegetable and particularly loved in New Zealand and Australia as it is cheap and plentiful for most of the year. Pumpkin and squash are very nutritious being an excellent source of vitamin A, containing high levels of the pro-vitamin A carotenes (β-carotene, β-cryptoxanthin and α-carothene) which the body can convert to vitamin A for good eye and skin health. The brighter and stronger the colour of the flesh the more carotenoids the pumpkin will contain. Some vitamin C, potassium and fibre are also supplied in small amounts. Pumpkin is very low in calories compared to other root vegetables such as potato, kumara and parsnip. Pumpkin is usually served in soup; salads; or as an accompaniment to meat meals. The chickpeas in this recipe also contribute valuable protein and so this dish can be served as a meal in its self. 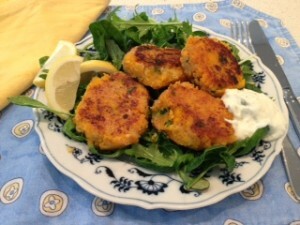 Try the pumpkin cakes served with other vegetables, salad, rice or bread. The pumpkin cakes can also be served as a vegetarian style burger or as an accompaniment to breakfast dishes such as poached eggs, grilled mushrooms and tomatoes. This recipe is very forgiving in that it can be made in advance and will keep for up to 3 days if well covered in the refrigerator (or longer if frozen). Once the cakes have been browned, they can be refrigerated and then reheated in a microwave when needed. Making them great as a quick snack or meal after sport, school or work. 2. Place the pumpkin into a food processor and add the chickpeas, garlic, cumin, lemon juice and coriander and blend briefly (to resemble a mashed, not pureed consistency). 3. Shape the pumpkin mixture into cakes and coat with the breadcrumbs. 4. Chill the pumpkin cakes overnight it possible and then brown in a fry pan with a spray of oil. Each cake contains: Energy 45kcals/ 190kJ; Protein 2g; Fat 1g; Carbohydrate 6.5g; Dietary fibre 1.8g and Sodium 127mg. Other fresh herbs such as parsley, chives, mint or basil are also nice if coriander is unavailable. You can also vary the flavour by choosing different oils to cook in such as avocado oil spiked with lime, garlic or lemon or olive oil spiked with orange.